Whatever the shape, size or style of your hotel, leisure or travel venue, an Oranka drink solution will make all the difference. Breakfast service for large venues may well suit a self-service option to reflect the buffet style, using plumbed in dispensers or stylish Vintage, Country, Yorkshire or Deluxe dispensers on a counter or a couple of Hydration Juices. 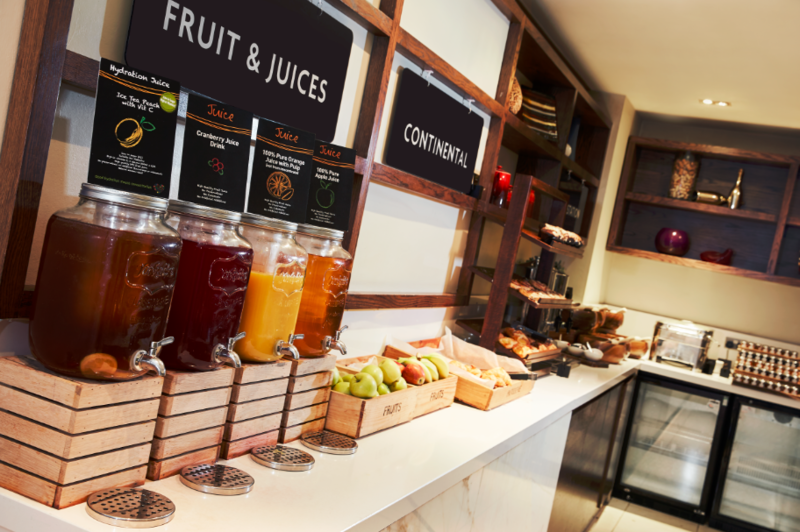 Smaller venues such as boutique hotels, may opt for a more personal table service approach of jugs filled by dispensers back of house or premium juices and smoothies using Juice Cube dispensers front of house. Even if you are a little stuck on space the Tower Dispenser can still offer a stunning drinks display in the minimum of spaces. If you are catering for the masses or for a small meeting you will be needing an adaptable, speedy and easy drinks approach. Be that for in room service using jugs or carafes or for a larger scale operation with plumbed in dispensers. More and more venues are seeking a drinks option for a central meeting or conference break out space that is primed and ready for the very moment the delegates pour out of their sessions. This is where the Hydration Station works perfectly, using a variety of stylish dispensers with attractive presentation that easily supplement the hot drinks offering. "We need to make sure that every aspect fulfils our hotel experience, right the way down to the quality and freshness our juice. With Oranka we easily achieve this, from the drinks provided such as their 1+19 Hydration Juice through to the very reliable, chilled plumbed in dispensers."